Raqqa (Arabic: الرقة‎‎ ar-Raqqah), also called Raqa, Rakka, al-Raqqah, and ar-Raqqah, is a city in Syria located on the northeast bank of the Euphrates River, about 160 kilometres (99 miles) east of Aleppo. It is located 40 kilometres (25 miles) east of the Tabqa Dam, Syria's largest dam. The Hellenistic, Roman, and Byzantine city and bishopric Callinicum (formerly a Latin—and now a Maronite Catholic titular see) was the capital of the Abbasid Caliphate between 796 and 809, under the reign of Harun al-Rashid. With a population of 220,488 based on the 2004 official census, Raqqa was the sixth largest city in Syria. During the Syrian Civil War, the city was captured in 2013 by the Syrian opposition and then by the Islamic State of Iraq and the Levant. ISIL went on to make the city its capital in Syria in 2014. As a result, the city has been hit by airstrikes from the Syrian government, Russia, the United States and several other countries. Most non-Sunni religious structures in the city have been destroyed by ISIL, most notably the Shi'ite Uwais al-Qarni Mosque. 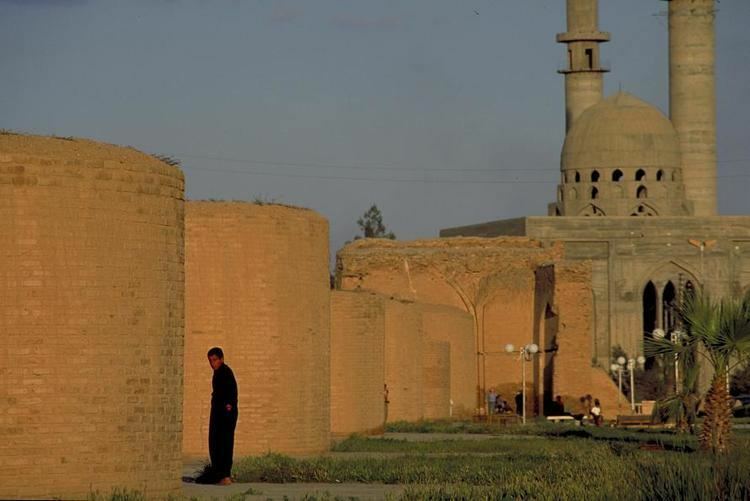 The area of Raqqa has been inhabited since remote antiquity, as attested by the mounds (tells) of Tall Zaydan and Tall al-Bi'a, the latter identified with the Babylonian city Tuttul. The modern city traces its history to the Hellenistic period, with the foundation of the city of Nikephorion (Greek: Νικηφόριον) by the Seleucid king Seleucus I Nicator (reigned 301–281 BC). His successor, Seleucus II Callinicus (r. 246–225 BC) enlarged the city and renamed it after himself as Kallinikos (Καλλίνικος, Latinized as Callinicum). In Roman times, it was part of the Roman province of Osrhoene, but had declined by the 4th century. Rebuilt by the Byzantine emperor Leo I (r. 457–474 AD) in 466, it was named Leontopolis (Λεοντόπολις or "city of Leon") after him, but the name Kallinikos prevailed. The city played an important role in the Byzantine Empire's relation with Sassanid Persia and the wars fought between the two states. By treaty, it was recognized as one of the few official cross-border trading posts between the two empires, along with Nisibis and Artaxata. The town was near the site of a battle in 531 between Romans and Sasanians, when the latter tried to invade the Roman territories, this time surprisingly via arid regions in Syria, to turn the tide of the war. The Persians won the battle, but the casualties on both sides were high. In 542, the city was destroyed by the Persian ruler Khusrau I (r. 531–579), who razed its fortifications and deported its population to Persia, but it was subsequently rebuilt by the Byzantine emperor Justinian I (r. 527–565). In 580, during another war with Persia, the future emperor Maurice scored a victory over the Persians near the city, during his retreat from an abortive expedition to capture Ctesiphon. In the year 639 or 640, the city fell to the Muslim conqueror Iyad ibn Ghanm. Since then it has figured in Arabic sources as al-Raqqah. At the surrender of the city, the Christian inhabitants concluded a treaty with Ibn Ghanm, quoted by al-Baladhuri. This allowed them freedom of worship in their existing churches, but forbade the construction of new ones. The city retained an active Christian community well into the Middle Ages—Michael the Syrian records twenty Syrian Orthodox (Jacobite) bishops from the 8th to the 12th centuries—and had at least four monasteries, of which the Saint Zaccheus Monastery remained the most prominent. The city's Jewish community also survived until at least the 12th century, when the traveller Benjamin of Tudela visited it and attended its synagogue. Ibn Ghanm's successor as governor of Raqqa and the Jazira, Sa'id ibn Amir ibn Hidhyam, built the city's first mosque. This building was later enlarged to monumental proportions, measuring some 73×108 metres, with a square brick minaret added later, allegedly in the mid-10th century. The mosque survived until the early 20th century, being described by the German archaeologist Ernst Herzfeld in 1907, but has since vanished. Many companions of Muhammad lived in Raqqa. In 656, during the First Fitna, the Battle of Siffin, the decisive clash between Ali and the Umayyad Mu'awiya took place ca. 45 kilometres (28 mi) west of Raqqa, and the tombs of several of Ali's followers (such as Ammar ibn Yasir and Uwais al-Qarani) are located in Raqqa and became a site of pilgrimage. The city also contained a column with Ali's autograph, but this was removed in the 12th century and taken to Aleppo's Ghawth Mosque. The strategic importance of Raqqa grew during the wars at the end of the Umayyad period and the beginning of the Abbasid regime. Raqqa lay on the crossroads between Syria and Iraq and the road between Damascus, Palmyra, and the temporary seat of the caliphate Resafa, al-Ruha'. Between 771 and 772, the Abbasid caliph al-Mansur built a garrison city about 200 metres to the west of Raqqa for a detachment of his Khorasanian Persian army. It was named al-Rāfiqah, "the companion". The strength of the Abbasid imperial military is still visible in the impressive city wall of al-Rāfiqah. Raqqa and al-Rāfiqah merged into one urban complex, together larger than the former Umayyad capital Damascus. In 796, the caliph Harun al-Rashid chose Raqqa/al-Rafiqah as his imperial residence. For about thirteen years Raqqa was the capital of the Abbasid empire stretching from Northern Africa to Central Asia, while the main administrative body remained in Baghdad. The palace area of Raqqa covered an area of about 10 square kilometres (3.9 sq mi) north of the twin cities. One of the founding fathers of the Hanafi school of law, Muḥammad ash-Shaibānī, was chief qadi (judge) in Raqqa. The splendour of the court in Raqqa is documented in several poems, collected by Abu al-Faraj al-Isfahāni in his "Book of Songs" (Kitāb al-Aghāni). Only the small, restored so called Eastern Palace at the fringes of the palace district gives an impression of Abbasid architecture. Some of the palace complexes dating to this period have been excavated by a German team on behalf of the Director General of Antiquities. During this period there was also a thriving industrial complex located between the twin cities. Both German and English teams have excavated parts of the industrial complex revealing comprehensive evidence for pottery and glass production. Apart from large dumps of debris the evidence consisted of pottery and glass workshops containing the remains of pottery kilns and glass furnaces. Approximately 8 kilometres (5.0 mi) west of Raqqa lay the unfinished victory monument called Heraqla from the period of Harun al-Rashid. It is said to commemorate the conquest of the Byzantine city of Herakleia in Asia Minor in 806. Other theories connect it with cosmological events. The monument is preserved in a substructure of a square building in the centre of a circular walled enclosure, 500 metres (1,600 ft) in diameter. However, the upper part was never finished, because of the sudden death of Harun al-Rashid in Khurasan. After the return of the court to Baghdad in 809, Raqqa remained the capital of the western part of the Abassid caliphs' empire, including Egypt. Raqqa's fortunes declined in the late 9th century because of the continuous warfare between the Abbasids and the Tulunids and then with the Shii movement of the Qarmatians. During the period of the Hamdānids in the 940s the city declined rapidly. At the end of the 10th century until the beginning of the 12th century, Raqqa was controlled by Bedouin dynasties. The Banu Numayr had their pasture in the Diyār Muḍar and the Banu Uqay had their center in Qal'at Ja'bar. Raqqa experienced a second blossoming, based on agriculture and industrial production, during the Zangid and Ayyubid period in the 12th and first half of the 13th century. Most famous is the blue-glazed so-called Raqqa ware. 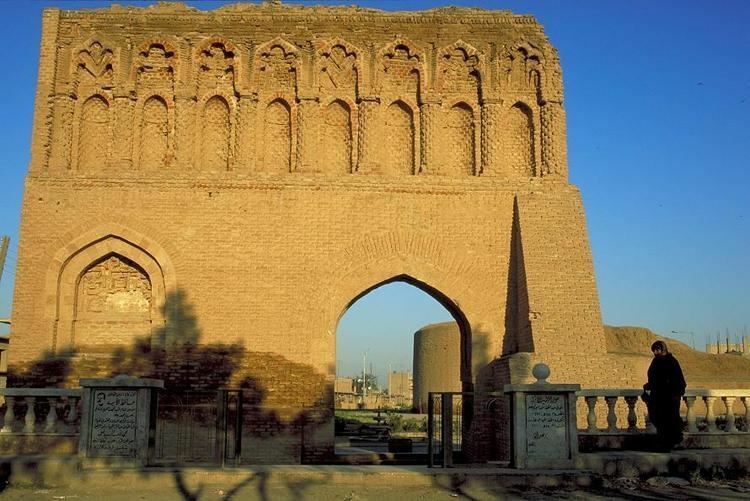 The still visible Bāb Baghdād (Baghdad Gate) and the so-called Qasr al-Banāt (Castle of the Ladies) are notable buildings from this period. The famous ruler 'Imād ad-Dīn Zangī who was killed in 1146 was buried here initially. Raqqa was destroyed during the Mongol wars in the 1260s. There is a report about the killing of the last inhabitants of the urban ruin in 1288. In the 16th century, Raqqa again entered the historical record as an Ottoman customs post on the Euphrates. The Eyalet (province) of Raqqa (Ottoman form sometimes spelled as Rakka) was created. However, the capital of this eyalet and seat of the vali was not Raqqa but Ar-Ruhā', about 160 kilometres (99 mi) north of Raqqa. In the 17th century the famous Ottoman traveler and author Evliya Çelebi only noticed Arab and Turkoman nomad tents in the vicinity of the ruins. The citadel was partially restored in 1683 and again housed a Janissary detachment; over the next decades the province of Raqqa became the centre of the Ottoman Empire's tribal settlement (iskân) policy. The city of Raqqa was resettled from 1864 onwards, first as a military outpost, then as a settlement for former Bedouin Arabs and for Chechens, who came as refugees from the Caucasian war theaters in the middle of the 19th century. In the 1950s, the worldwide cotton boom stimulated an unpreceded growth of the city and the re-cultivation of this part of the middle Euphrates area. Cotton is still the main agricultural product of the region. The growth of the city meant on the other hand a removal of the archaeological remains of the city's great past. The palace area is now almost covered with settlements, as well as the former area of the ancient al-Raqqa (today Mishlab) and the former Abbasid industrial district (today al-Mukhtalţa). Only parts were archaeologically explored. The 12th-century citadel was removed in the 1950s (today Dawwār as-Sā'a, the clock-tower circle). In the 1980s rescue excavations in the palace area began as well as the conservation of the Abbasid city walls with the Bāb Baghdād and the two main monuments intra muros, the Abbasid mosque and the Qasr al-Banāt. There is a museum, known as the Raqqa Museum, housed in an administration-building erected during the French Mandate period. In March 2013, during the Syrian Civil War, Islamist jihadist militants from Al-Nusra Front and other groups (including the Free Syrian Army ) overran the government loyalists in the city in the Battle of Raqqa and declared it under their control after seizing the central square and pulling down the statue of the former president of Syria Hafez al-Assad. The Al Qaeda-affiliated Al-Nusra Front set up a sharia court at the sports centre and in early June 2013 the Islamic State of Iraq and the Levant said they were open to receive complaints at their Raqqa headquarters. Migration from Aleppo, Homs, Idlib and other inhabited places to the city occurred as a consequence of the uprising against Assad, the city was known as the hotel of the revolution by some because of the fact that people from other places moved there. ISIL took complete control of Raqqa by 13 January 2014. ISIL proceeded to execute Alawites and suspected supporters of Bashar al-Assad in the city and destroyed the city's Shia mosques and Christian churches such as the Armenian Catholic Church of the Martyrs, which has since been converted into an ISIL police headquarters and an Islamic center tasked to recruit new fighters. The Christian population of Raqqa, which had been estimated to be as much as 10% of the total population before the civil war began, largely fled the city. On 15 November 2015, France, in response to the attacks in Paris of two days earlier, dropped about 20 bombs on multiple ISIL targets located in Raqqa. Pro-government sources say an anti-IS uprising took place between March 5 and March 7 2016. On 26 October 2016 US Defense Secretary Ash Carter said that an offensive to retake Raqqa from IS would begin within weeks. The Second Battle of Raqqa began on 6 June 2017. In the 6th century, Kallinikos became a center of Assyrian monasticism. Dayra d'Mār Zakkā, or the Saint Zacchaeus monastery, situated on Tall al-Bi'a, became renowned. A mosaic inscription there is dated to the year 509, presumably from the period of the foundation of the monastery. Daira d'Mār Zakkā is mentioned by various sources up to the 10th century. The second important monastery in the area was the Bīzūnā monastery or Dairā d-Esţunā, the 'monastery of the column'. The city became one of the main cities of the historical Diyār Muḍar, the western part of the Jazīra. Michael the Syrian records twenty Syrian Orthodox (Jacobite) bishops from the 8th to the 12th centuries—and had at least four monasteries, of which the Saint Zaccheus Monastery remained the most prominent. In the 9th century, when Raqqa served as capital of the western half of the Abbasid Caliphate, Dayra d'Mār Zakkā, or the Saint Zacchaeus Monastery, became the seat of the Syriac Orthodox Patriarch of Antioch, one of several rivals for the apostolic succession of the Ancient patriarchal see, which has several more rivals of Catholic and Orthodox churches. Callinicum early became the seat of a Christian diocese. In 388, Byzantine Emperor Theodosius the Great was informed that a crowd of Christians, led by their bishop, had destroyed the synagogue. He ordered the synagogue rebuilt at the expense of the bishop. Ambrose wrote to Theodosius, pointing out he was thereby "exposing the bishop to the danger of either acting against the truth or of death", and Theodosius rescinded his decree. Bishop Damianus of Callinicum took part in the Council of Chalcedon in 451 and in 458 was a signatory of the letter that the bishops of the province wrote to Emperor Leo I the Thracian after the death of Proterius of Alexandria. In 518 Paulus was deposed for having joined the anti-Chalcedonian Severus of Antioch. Callinicum had a Bishop Ioannes in the mid-6th century. In the same century, a Notitia Episcopatuum lists the diocese as a suffragan of Edessa, the capital and metropolitan see of Osrhoene. No longer a residential bishopric, Callinicum has been listed by the Catholic Church twice as a titular see, as suffragan of the Metropolitan of the Late Roman province of Osroene : first as Latin - (meanwhile suppressed) and currently as Maronite titular bishopric. No later then the 18th century, the diocese was nominally restored as Latin Titular bishopric of Callinicum (Latin), adjective Callinicen(sis) (Latin) / Callinico (Curiate Italian). In 1962 the simultaneously suppressed Latin Titular see of Callinicum (see above) was in turn restored, now for the Maronite Church (Eastern Catholic, Antiochian Rite) as Titular bishopric of Callinicum (Latin), Callinicen(sis) Maronitarum (Latin adjective) / Callinico (Curiate Italian). Samir Mazloum (1996.11.11 – ...), as Bishop of Curia of the Maronites (2000 – retired 2011.08.13) and on emeritate. ISIL has banned all media reporting outside its own efforts, kidnapped and killed journalists. However, a group calling itself Raqqa Is Being Slaughtered Silently operates within the city and elsewhere. In response, ISIL has killed members of the group. In January 2016, a pseudonymous French author named Sophie Kasiki published a book about her move from Paris to the besieged city in 2015, where she was lured to perform hospital work, and her subsequent escape from ISIL. Prior to the Syrian Civil War the city was served by Syrian Railways.